I am finally back to blogging, it was long time ago since I posted anything. And the first bundle I want to highlight is Abstract Impression. For me it was one of the stamps I kinda liked, but did not love and did not plan to have. But (it is always but, haha) then I saw many fun ideas and gave it a try. It is so much fun to do 2 step stamping and color combinations are unlimited with that technique. New purples are amazing together, don't you think? Fold card base in half. Randomly stamp the front in Gorgeous Grape ink using one of the stamps (looking like dots) to create some texture. Stamp sentiment in Gorgeous Grape ink on the bottom of whisper white piece. This stamp set is 2 step stamping set, so for each image you will need to use first step (bigger image) with lighter color and second step – smaller image with darker color. Stamp leaves in Lemon lime twist toward the top (see picture), then using Call me Clover ink – stamp second leaves. 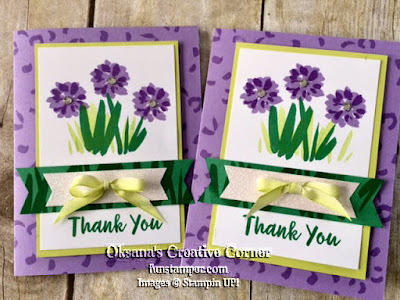 Using Highland Heather – stamp 3 flowers, and Gorgeous Grape ink – second step. Use 2nd step leaves and Call me Clover ink randomly stamp Call me Clover piece. 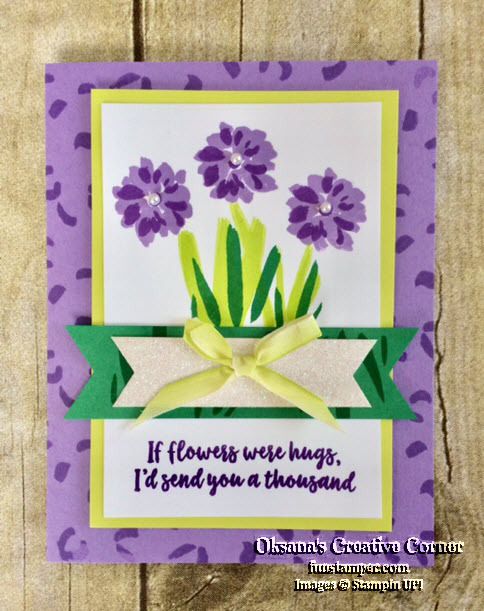 Adhere whisper white piece to Lemon Lime Twist piece, then add co card front with dimensionals. Flag both ends of sparkle paper and call me clover piece. Adhere sparkle piece to Call me Clover, then adhere above greetings. Tie a bow from lemon lime twist ribbon and adhere with a glue dot to the center of sparkle paper. Add 3 pearls to the center of the flowers.